We rescue and place needy Chesapeake Bay Retrievers of all ages. Do You Need Help with your Chessie? Are you a rescue with a chessie? Do you need help with your Chessie? We work with rescues to help find a suitable home for Chessies within your organization. We are a father-daughter team that has been involved with Safe Harbor for years and operate the rescue out of our home in Amherst, MA. 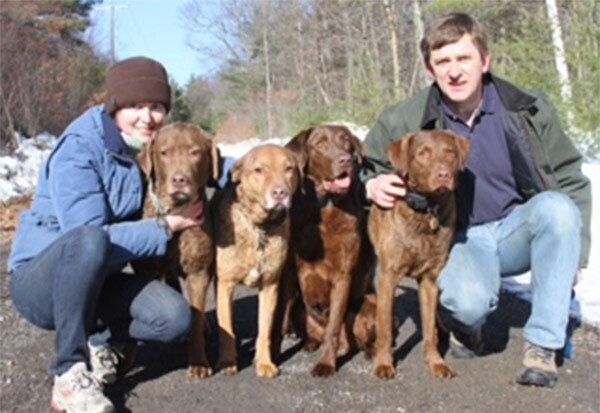 Our fifteen year relationship with Safe Harbor began with our participation in the transportation of rescued Chessies and led to our adoption of multiple dogs from Jane over the years. 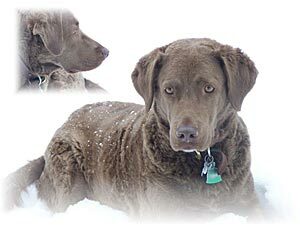 The very nature of a chessie is such that he does not do well in the ordinary shelter environment; thus it is not a safe place for most chessies. Coming into Chesapeake Safe Harbor he will be among his own kind and receive the understanding care and training of a family devoted only to this special breed. Whatever the reason for needing a new start in life, Chesapeake Safe Harbor will provide each chessie with its individual needs – loving care, vet attention and rehabilitation as needed to enhance his chances of finding an appropriate new home where he can do his job as custodian of this home and family. Chesapeake Safe Harbor also acts as a referral service to our national network of volunteers, and is continually available for education of the public about this great breed.